On Saturday June 4, songwriting duo Marian Hill celebrated with fans and games at the Miller Lite Beer Hall following their performance at Governor's Ball music festival in New York City. 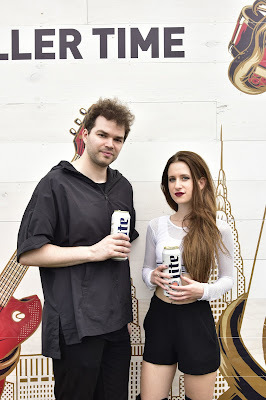 The dynamic duo from Philadelphia, who recently debuted their new single "Mistaken" spent time with fans in the 360-degree photo booth and played games including Miller Lite branded shuffle board. The Miller Lite Beer Hall was created by music experiential and sponsorship agency MAC Presents. Other highlights included temporary tattoos designed with the lineup for each day of the festival. Skee Ball, Pac Man, shuffle board, ping pong, vintage polaroid's taken by photographer Jean Andre, and special fan giveaways including Miller Lite-branded charging stations, koozies and t-shirts. The Miller Lite Beer Hall was reimagined for today's time but harkening back to Miller's start in Milwaukee in 1855. MAC Presents worked to recreate a modernized beer hall feel with wooden fixtures, beer barrels, gun-metal enclosures and benches that were updated with built-in charging stations. Additionally, the beer hall doubles as a mini game hall, with throwback games and activities branded with Miller Lite artwork created exclusively for the Governor's Ball activation. Fans can enjoy the Miller Lite Beer Hall exclusively at Governors Ball began June 3 continuing through June 5. For the past twelve years, MAC Presents has been the leading connector of bands, brands and fans, creating award-winning partnerships, events and experiences for brands including Delta, Bud Light, Citi, Microsoft, Southwest, YouTube, Nielsen, Miller, AT&T, Samsung and others. A sponsorship and experiential agency with music at its core, MAC Presents focuses on custom event creation, brand strategy and fully integrated social media and branded content. MAC Presents has received numerous awards and accolades including Event Marketer's "It List" (2014 & 2015), Event Marketer's Silver Ex Award for Citi/The Rolling Stones (2014) and a Gold Ex Award for Billboard Music Awards/Citi/John Legend (2015). MAC received Silver CLIO Awards for Citi/ The Rolling Stones and Citi/Sound City Players/ Foo Fighters/ SXSW integrated campaigns (2014). MAC is a five-time recipient (and 10-time nominee) of the Billboard Concert Marketing & Promotion Award- including back to back wins for Southwest Airlines/Imagine Dragons (2015) and Citi/Billy Joel/MSG (2014). The MIDEM Marketing Competition, Shorty Awards, BizBash, Event Technology Awards and Mobile Marketing Awards have also recognized MAC programs in the last three years.